Tom Harkin checks his phone at the Democratic convention. 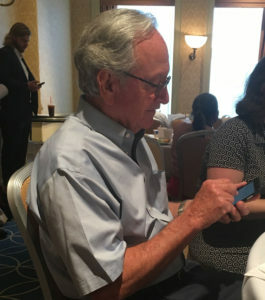 Former Iowa Senator Tom Harkin is scheduled to speak at the Democratic National Convention this afternoon, at about three o’clock Iowa time. Harkin is promising to make it brief. But Harkin revealed he got the hook the first time he spoke at a national convention. It was 1984 and Harkin was running for the U.S. Senate for the first time. He was given a speaking slot on the main convention stage. Harkin is one of the Clinton delegates at the Democratic National Convention.